After clicking the Create button your account has been created, and you will see the message Success! Account created, you will see this message on the same page. Now click on the back option and come back your cPanel account, click on the button forwarder in mail section. 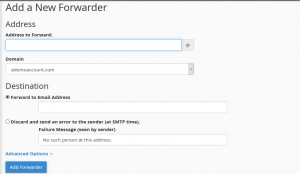 then click add forwarder lick. You should check here send mail as, and click on the add another email address you own.